It happens all the time, the car battery is dead, and I need to get to work! How can you tell if your vehicles battery is getting weak? What are the signs of a weak battery? Should I buy a cheap battery for my car just to get by? Batteries are the heartbeat of the digital age, would you buy cheap batteries for your camera, right before going on vacation, or would you by batteries that last? A fully charged battery in your vehicle should hold a charge for hours, even with the car doors open, the radio on and the interior lights on. One of the biggest mistakes people make when listening to the car radio while cleaning their vehicle, is to leave the key in the run position with all the instrument and warning light on, blower motor running, ac fan running and you don’t even realize it. If you’re going to listen to the radio while cleaning your vehicle, turn the key to accessory, not run! or a professional series tester found at your local garage, either way, load testing it will provide you with vital information about your batteries capacity and charge level. If you have no load tester, you should find your fastest way to daks Toyota and get yourself one at an affordable price because its a must have for everyone. I’m not sure why car manufactures put a battery warning light on the dash, it will never illuminate when your battery is dying or even when your battery is dead, the battery light is for the alternator, not the battery. If your battery light comes on, it’s because your alternator is either over charging, under charging, or not charging at all. There are several components that could make the battery warning light come on, for example; the ELD, (electrical load detector) voltage regulator, a blown fuse, or a bad wire harness, but it still leads to the alternator not charging normally. If your battery light is on and your engine turns over, have it checked out right away. 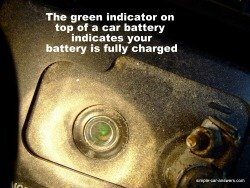 The vehicle battery will hold a charge for a while, but not forever, especially if you’re using the radio, heater, wipers and head lights, this will drain the battery quick and leave you stranded, so don’t wait to have the battery warning light checked out, if it on, get it checked quick. So how can you tell your vehicles battery is getting weak? The most common symptom is a slow engine crank, when you start to hear the engine in your car crank slowly, have the battery checked right away. The engine draws a lot of amperage from the battery during start up, that’s why the slow crank is the most common symptom. Another symptom is if you leave your map light on overnight and your car battery is dead by morning, or if you didn’t shut your door completely and the interior light (one light only) drained the car battery over night. If the battery is in good condition and fully charged it should last overnight with one small light burning, if it’s dead by morning, it’s a sign your battery is getting weak. Most new automotive batteries have an indicator on the top of the battery, if the battery has a good charge, the indicator will be green, if it has a low charge, the indicator will be black. If the indicator is black, I recommend charging the battery with a battery charger, don’t just have your battery jump started and hope your alternator does the job for you. I recommend charging the battery with a battery charger until the indicator changes back to green, then test the battery with a hand held battery tester like the or have the battery charged and tested professionally to avoid being stranded with a dead battery. If you replace your cars battery yourself, please do not throw it in the trash, the battery acid is very harmful to the environment and to anything it touches. 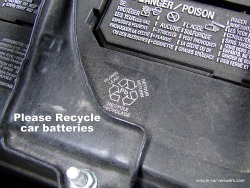 Batteries should be recycled, just bring it to any auto parts store or garage, and ask if they can recycle it for you. “My motorcycle battery was dead every spring, so I would charge it up and it would be good for the summer, the only problem, I was replacing the battery every 2 years. I never wanted to spend $40 on a battery tender but yet I would replace the battery for $80 every 2 years, was that stupid or what? I haven’t replaced my motorcycle battery in over 5 years now, and I have never been stranded with a dead battery, now I have battery tenders for my boat, lawn mower and 4 wheelers as well, so keep it charged”. You can always trust Daks Toyota with your Toyota Automotive worries. Come get the recommended toyota spares from our Distribution warehouse and possibly a service from our certified toyota mechanics. I would like to that a car battery failure is not often caused by a workshop defect. However, poor driving habits, improper maintenance- are the quotidian causes. I think it can be tough to examine and determine the causes that can drain your car battery. Because sometimes it can cause due to human error, while bad charging, parasitic drain, defective alternator, and an old battery can be the causes now and then. But if you provide your car battery the necessary aftercare, then it can last for a lasting period of time. Thus, I would suggest that you should hire a proficient car mechanic and examine your battery performance at regular intervals in order to keep your car battery serviceable and avoid the possibility of jumpstarting. This is some really good information about what to do if your car battery dies. I liked that you pointed out that you need to keep a battery charged. It might be smart to get a battery charger for a car. I’m happy that I found this article about what to do when my car battery is dead. My husband and I put an antique car in storage over the summer, and when we went back to start it up, it wouldn’t turn over. My husband thinks that the battery died! We need to look for a business that can give us a new car battery. After we install it, I will be sure to make sure all the doors are closed so a light doesn’t turn on, as you mentioned!